In a hierarchy, authority, responsibility and job function are clearly defined, along with the road to promotions. Communication is clear, since it travels directly from top to bottom, so everyone knows exactly what his duties are. Hierarchies organize people into departments and teams that lead to teamwork and motivation. Since decisions have to travel from top to bottom, and communication from bottom to top, hierarchies respond slowly to new information and changes and have a bureaucratic decision-making process. Departments more focused on their own goals than company goals can lead to rivalries and selfish decisions. To stress this further more hierarchy is a way of doing things in an orderly manner, ranging from top to bottom or from button to the top. In this form, at a glance one will be able to easily identify where things are suppose to be and easily place them in accord without too many questions, this seems to be one of the key rules hierarchy plays in real life scenario, also when it comes to networking, the concepts are almost the same, things has to be well structured to ascertain network stability and obtain maximum throughput. Each layer has specific responsibilities. layer, which forwards the requests to the core if needed. things we don’t want to do. Now, there are a few things that we want to do as we design the core. (with redundant links), or even ATM. _ Design with speed in mind. The core should have very little latency. The distribution layer is the place to implement policies for the network. 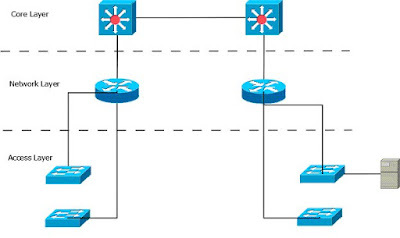 Here you can exercise considerable flexibility in defining network operation. exclusively belong to one of the other layers. The access layer contains devices that allow workgroups and users to use the services provided by the distribution and core layers. In the access layer, you have the ability to expand or contract collision domains using a repeater, hub, or standard switch. In regards to the access layer, a switch is not a high-powered device, such as those found at the core layer. Rather, a switch is an advanced version of a hub. A collision domain describes a portion of an Ethernet network at layer 1 of the OSI model where any communication sent by a node can be sensed by any other node on the network. This is different from a broadcast domain which describes any part of a network at layer 2 or 3 of the OSI model where a node can broadcast to any node on the network. Enable MAC address filtering: It is possible to program a switch to allow only certain systems to access the connected LANs. Create separate collision domains: A switch can create separate collision domains for each connected node to improve performance. Share bandwidth: You can allow the same network connection to handle all data. Handle switch bandwidth: You can move data from one network to another to perform load balancing.